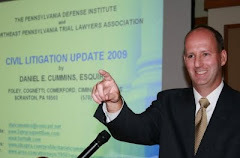 In yesterday's Tort Talk, I reviewed the summary Judgment decision that was entered for a Defendant lessee under the Hills and Ridges Doctrine in a recent decision out of the Dauphin County Court of Common Pleas under the case of Williams v. Dialysis Prop., 125 Dauphin 270 (May 31, 2013). I originally noted in that post that I did not have a copy of that decision. A copy of the case was forwarded to my attention by Paralegal Clare McManus of Robert J. Casey, Jr. and Associates as well as by Attorney Wade E. Manley of the Lemoyne, PA law firm of Johnson, Duffie, Stewart & Weidner and I thank them for that.